Robots for cleaning office buildings, warehouses, and facilities are no longer a concept for the future, but are actually a reality in the present. Many of the leading janitorial equipment manufacturers have developed autonomous floor scrubbers & vacuums and have placed them in hospitals and warehouses across the country. Robots can be as large as 3 feet wide, 2 feet across and 3.5 feet high, costing close to $40K, or as small as the residential vacuum on steroids, such as the Roomba or Makita . The technology is advancing at a rapid pace. As with all new technology, there have been a few false starts where the technology did not live up to its promises. Now, with all the capital being invested in autonomous vehicles and robotics for other industries, the robots designed for cleaning are making tremendous strides forward. The advantages of using robots for non-complex, repetitive task are numerous. First and foremost, a significant advantage is quality. Robots never miss vacuuming or scrubbing any of the surfaces they are programmed to clean. They don’t call in sick, never need to send or answer a text, have no need to use the restroom, cannot be accused of stealing or causing property damage, and never suffer from a lack of motivation on days when some may just feel like staying home. Robots also provide you with the ability to reassign the workforce from vacuuming and floor scrubbing to other detailing tasks which cannot be performed autonomously. As a result, your property gets more cleaning for the same labor. 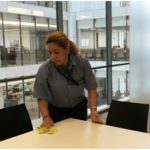 Can robotics in cleaning be justified in cost savings? The answer is yes. Even the most expensive units have a pay back of two years.Of course, this is dependent on labor cost in the region the robots are being deployed. 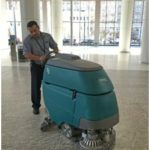 With this emerging technology, don’t be surprised, in the not so distant future, if you see a robot scrubbing a lobby floor or vacuuming your hallways. For more information, give us a call at 866-OH-BRAVO or visit www.bravogroupservices.com.